Product information "Dry Contact Sensor (Output)"
Many systems and machines are equipped with dry contacts. With a relay contact, also called dry contact, status messages or operating states are transmitted. Network Management Systems such as HP OpenView, Nagios, OpenNMS, PRTG, WhatsUp Gold, Zabbix and many others. SNMP-enabled SCADA systems are also supported. Of course, the remote monitoring solutions from Didactum also support SNMPwalk of connected dry contacts. This new dry contact sensor (Output) was developed for Didactum`s SNMP-based remote monitoring units. 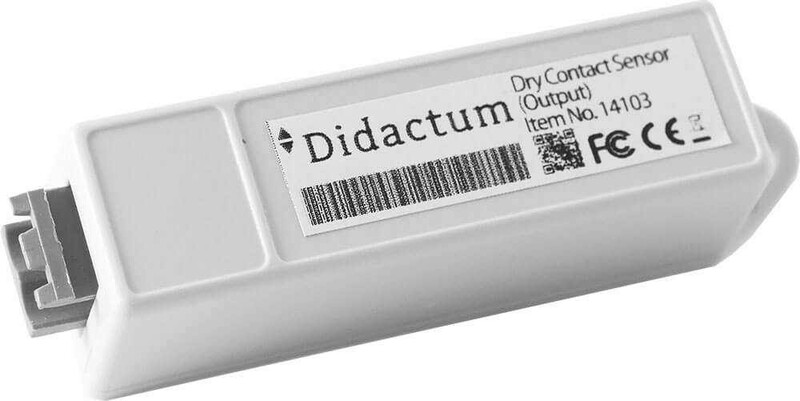 Like all sensors produced by Didactum, also the new sensor dry contact / Dry Contact Sensor (Output) is equipped with a sticker. This facilitates the on-site installation of the sensors. This sensor is simply connected to a 12V output or on the 1-Wire port of the networked monitoring system. In WebGUI you can name the dry contact sensor according to your wishes. The connected Dry Contact Sensor (output) can be switched manually, time-controlled or event-driven. The integrated logic of Didactum`s networked remote monitoring devices supports the practical creation of individual actions and emergency plans. If the precise temperature sensor (item No. 14010) detects overheating of server room or 19-inch rack, the Dry Contact Sensor (Output) will switch on the the connected air conditioning. Or if the AC Voltage Sensor (item No. 14016) detects power failure in data center, the Dry Contact Sensor (Output) will start the emergency power diesel aggregate. Per SNMP command, the Dry Contact Sensor (output) can also be switched, so you can integrate the remote infrastructure monitoring solutions from Didactum into your Nagios or OpenNMS network management software. All events are stored in syslog of Didactum`s networked monitoring units. The syslog can be sent via FTP upload directly to your headquarter for further evaluations. Via Dry Contact Output, alerts can be sent to alarm system or to building monitoring systems. If water damage is detected by Didactum`s proven water leakage sensor (item No. 14018), the alert message can be carried out to the building management system (BMS). Related links to "Dry Contact Sensor (Output)"
Delivery: Dry Contact Sensor (Output) for Didactum remote monitoring units. 2 meter cable, mouniting sticker and screw included. Customer evaluation for "Dry Contact Sensor (Output)"